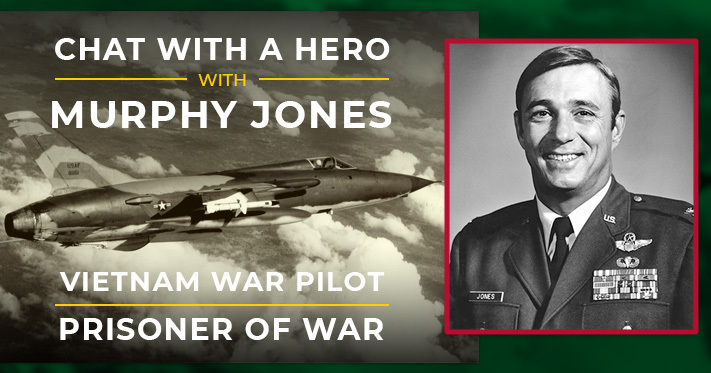 As part of our educational programs, the AMC Museum will be hosting another Chat with a Hero—The Murphy Jones Story in the main hangar. Colonel Murphy Neal Jones was born in Baton Rouge, School and attended Tulane University on a football scholarship. He graduated in 1960 and received his commission as a second lieutenant the same day. He received his pilot wings in 1961 and flew the F-100, F-105D and the A-7D during his career. On his third combat tour in Vietnam, he was shot down and captured on the outskirts of Hanoi on June 29, 1966 during the first bombing raid of Hanoi. He was wounded by shrapnel in both legs and sustained a dislocated shoulder, a broken arm and six broken vertebrae when he ejected at approximately 300 feet and over 620 miles per hour. After spending more than six and one half years as a prisoner of war, he was released on February 12, 1973. Neal returned to the cockpit after his release and served as Commander of the 357th Tactical Fighter Squadron and as Chief of the War and Mobilization Division, Headquarters United States Air Force. He retired as a colonel after twenty-one years of service. There is no fee or tickets required for admission or parking. Very disappointed that we didn’t know this event was closed to public. When we arrived, we were turned away at the gate. This event was public and free at the AMC Museum. Did you happen to approach the Dover AFB Main Gate by chance on Route 1? The only way to visit the museum is through our public access gate via Route 9.